Alarm clock malfunction again, resulting in a ninety minute delay in getting going. Snooze buttons are not supposed to work like this and I shall be writing a strongly-worded letter of protest to my MP. Or something. Anyway, no doubt you'll be pleased to learn that eastern Kansas has a fair bit more going for it that its western counterpart. There are more trees for starters, and also things which could almost be called hills. The route has been losing altitude steadily since mid-way through yesterday; just east of Laramie it reached over 2600m but is now somewhere below 200. Stull seems to consist of about three houses and the same number of churches. Each of which presumably has a congregation of one family. 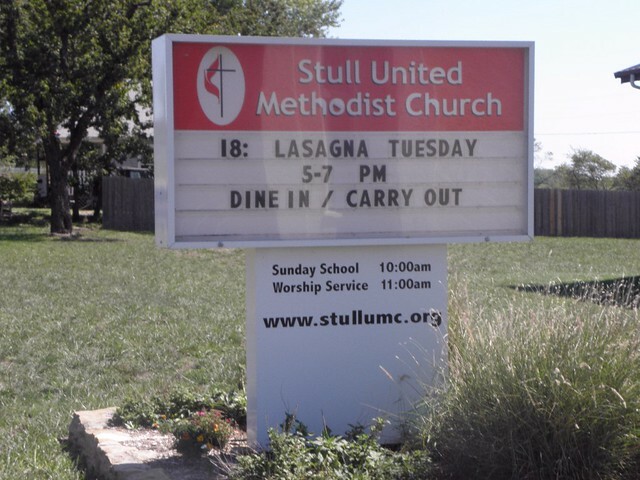 If I lived there I'd pretend to be a member of the United Methodists as they do lasagna (sic) on Tuesdays. Stull, now with added "lasagna"
A little further up the road is Stull cemetery, which is alleged to be a gateway to Hell. If this is true, Stan and I will be making millions as it will be possible to enter at Stull and leave via Swindon, or vice-versa, thereby eliminating all that tedious mucking about with aeroplanes. While Stull looks an OK sort of place, the downside is that you'd still have to visit Swindon. Meanwhile if some kind person could send me via regular Babbage-Post the current url of the remains of Theme Park I'd be ever so grateful. 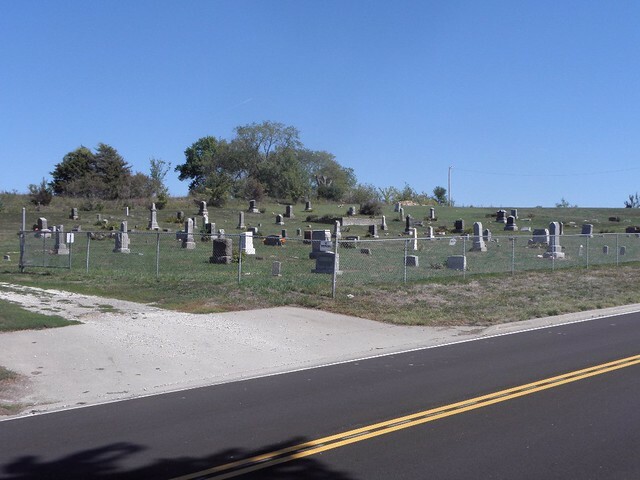 I could have spent, oooh, minutes, wandering the streets of Stull (which are two in number) but time was short and I needed more of it to get lost in Lawrence while trying to find the western end of I-435. This takes one to I-470 and thence back onto I-70 without having to pay to use the Kansas Turnpike. And drags one kicking and screaming into Missouri into the bargain. There is a GBFO sign at the state line but this is of little use if one is doing 70 mph four lanes away. This semi-loop takes one round to the south of Kansas Cities, of which there are also two. The original one is that of Missouri - its smaller namesake on the opposite bank of the river did not exists until Kansas became a state or something. You don't have to imagine the conversation that was shouted back and forth across the river, because Dave Gorman has done it for you in America Unchained. 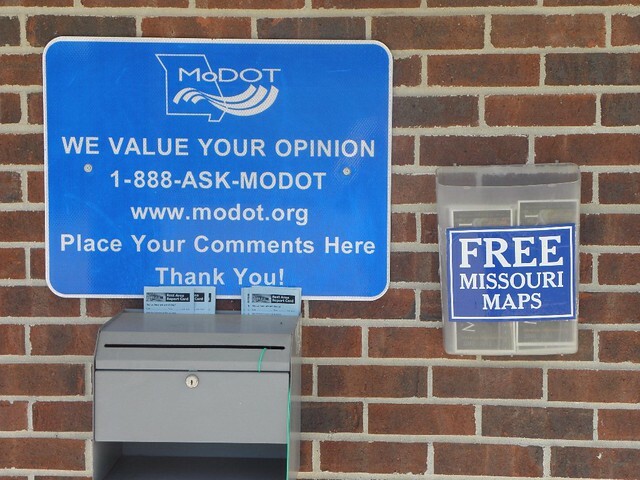 Once back on I-70, I was definitely in Missouri although it took about eighty miles before I could find some fairly rubbish proof of passage. "Welcome to Missouri. Now sod off" would have been better than what I ended up with. In this rest area was a Ford Flex, a big square thing with lots of seats. Its licence plate read "GET-EM" which is apparently something to do with not liking terrorists. And then Fox "News" wonders why half the population of the Muslim world is busy burning the Stars'n'Stripes while chanting "Death to Satan Amerika!" in letters about six feet high. I'm not sure whether this is worse than the "SWEET CRON" sign I encountered in Oregon in 2009. I suspect it is. And so to Wentzville. Wentzville is close to being a 'burb of St. Louis (pronounce "Sunt Lewis", natch) and was immortalised in song by George Thorogood and the Destroyers. This, and the fact that it doesn't have a branch of Burger King, is all you need to know about Wentzville. 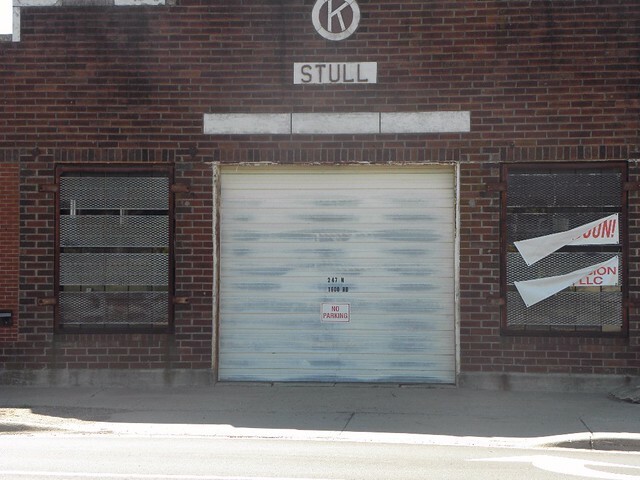 The Stull photo collection is hilarious. I raise my Becks and salute Stull.